Clean eating has been a strict motto of mine over the past year. It was a harsh transition at first but extremely satisfying when you can know exactly what is in your food. I have switched to buying all organic and extremely limiting my processed food intake. This lifestyle change has not only made me feel better about myself but has also made me feel like I am doing the best I can to keep my family healthy. With the many changes I have undertaken over the past year, perhaps the most daunting was becoming an independent Beachbody coach. At first I signed on only to get a discount on my monthly Shakeology, but I have recently really enjoyed helping others learn how to lead a healthier lifestyle. After speaking with several individuals who asked me about my recent successes, the one area they have difficulty with is giving up their dessert. These individuals want to lead a healthier lifestyle but they also want a treat now and then, especially for their children. They asked me for advice on healthier alternatives to popular box mixes or supermarket sweets. At first I did not have an answer for them. I have been a pastry chef for the website Honeybees Patisserie for over five years, however the job description never required me to acknowledge the healthiness of the products. With little knowledge of healthier desserts, I elected to do heavy research and today I present you with a skinnier cake option. I use the term “skinny” because it is certainly not healthy to eat this product all of the time as you would a healthy meal. A skinny dessert is simply a healthier indulgence and should be strictly an occasional indulgence. 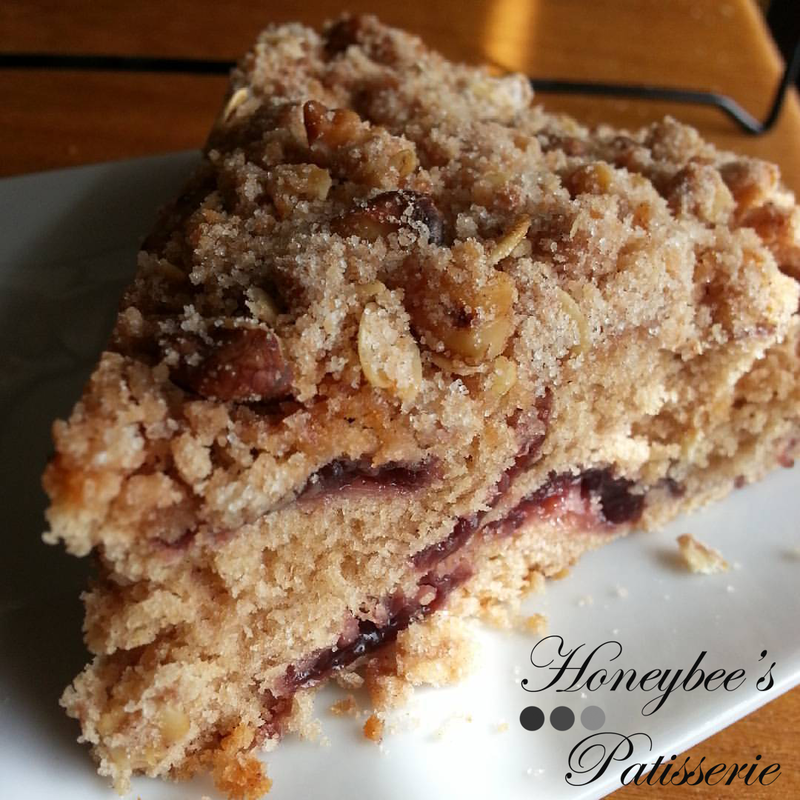 This cherry-walnut streusel cake is designed to include healthier, organic ingredients and to keep you satisfied longer. I originally made this recipe after purchasing a fresh bunch of sweet Bing cherries from my local farmer’s market. It is best to make this cake when cherries are in season between May and July but if you want to prepare it outside of the cherry season you may use frozen cherries instead of fresh. If you do elect to use frozen cherries, be sure that you thaw them and drain any juice before measuring. I recommend selecting Bing or Rainier cherries as their flavor will concentrate while baking and help keep this hearty, coffee style cake moist. By now you are probably wondering how this cake is lighter than any other recipe out there. Two elements of this streusel cake differ greatly from its traditional counterpart….the lack of butter and the blend of flours. Streusels are traditionally made with a good amount of butter. The missing butter in the streusel is replaced with olive oil and a small amount of reduced-fat buttermilk, allowing more butter to remain in the cake without significantly adding calories or fat. Aside from the reduced amount of butter, half of the traditional all-purpose flour is replaced with whole-wheat pastry flour. 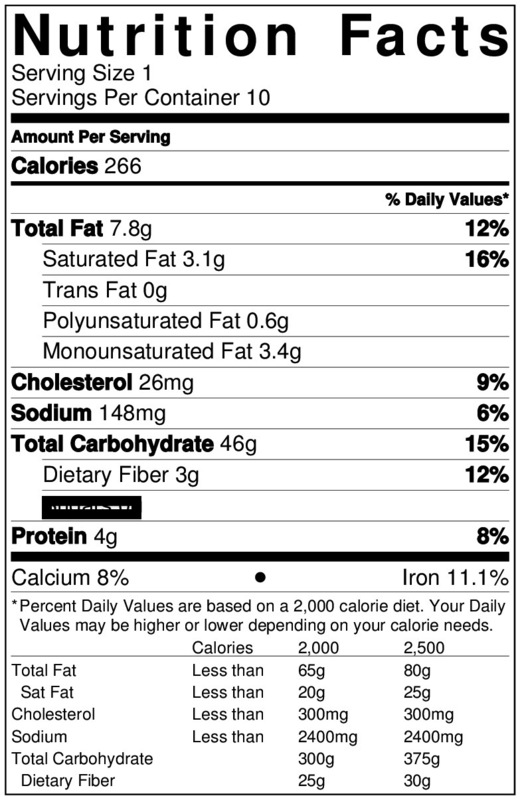 Whole-wheat pastry flour is more nutrient dense than all-purpose flour and specifically contains more protein than cake flour. By replacing half of the all-purpose flour with whole-wheat pastry flour, the cake has added nutrients to keep you fuller longer (preventing the risk of overindulging) without becoming too dense as would be the case if you used only whole-wheat flour. This cake is a great option for treating you and your family to dessert without completely abandoning a healthy lifestyle. It can also be a great addition at breakfast when served with coffee or tea. One cake will yield 10 servings. Each serving should be cut into a small wedge. Total preparation time for this cake is approximately 1 ½ hours. If you are following Weight Watchers, one wedge is 5 points or 7 Points Plus. Preheat oven to 375°. 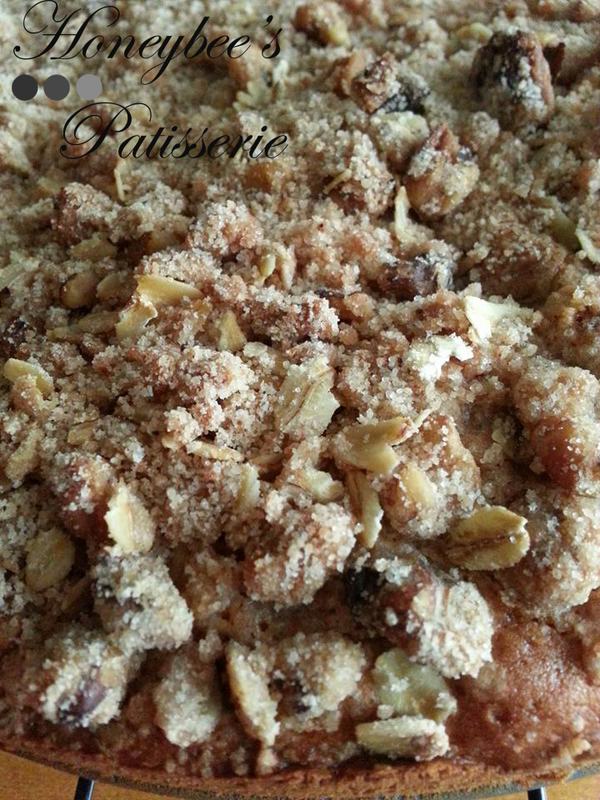 Prepare streusel by combining sugar, flour, oats, walnuts, cinnamon, and nutmeg together in a small bowl. Add the oil and buttermilk and stir to combine. 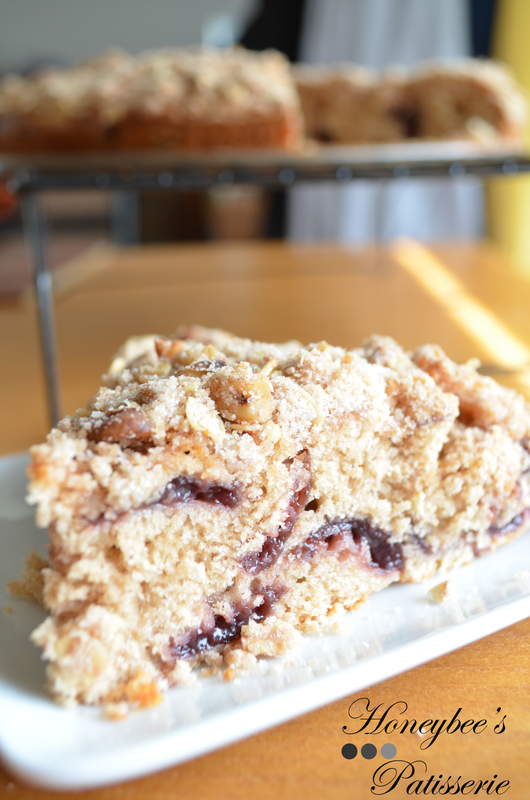 Set the streusel aside. Prepare the cake by whisking both flours, baking powder, cinnamon, nutmeg, and salt in a large bowl. In the bowl of a stand mixer fitted with the paddle attachment beat the sugar and butter together on medium speed until light and fluffy. Add the egg and beat again until combined. Mix in the almond extract until just combined. Add a portion of the flour mixture and beat until combined. Add half of the buttermilk and mix again. Add another portion of the flour mixture beating until combined followed by the rest of the buttermilk. Add the remaining portion of the flour and beat until well combined. Remove the bowl from the mixer and gently stir in the cherries by hand. Spoon the batter evenly into a 9 inch springform pan coated with nonstick baking spray. Sprinkle batter evenly with the streusel. Bake the cake for 40 to 45 minutes, rotating the pan halfway through baking. Cool cake in the pan on a wire rack for 15 minutes. Remove cake from the pan and continue to cool on the wire rack or serve warm. Reblogged this on Honey Bee Healthy.